This Irish rosary features an oxidized silver Celtic crucifix along with a St. Patrick medal in the center and green beads. This Irish rosary features 6mm wide green beads along with a St. Patrick medal in the center and a tiny Miraculous Medal charm on the cross. The St. Patrick rosary also features an oxidized silver Celtic crucifix that is enhanced with Trinity knots on both sides along with the word Erin, Ireland in Gaelic, on the back. These Irish rosary beads are a full five decades and it is made in Italy by Ave Maria. This green bead rosary is gift boxed with Celtic knot and Celtic cross history cards, complements of The Irish Gift House. These Irish rosary beads have been crafted in sterling silver. This Irish rosary features green shamrock beads along with a sterling silver crucifix and a Lady of Knock center piece. 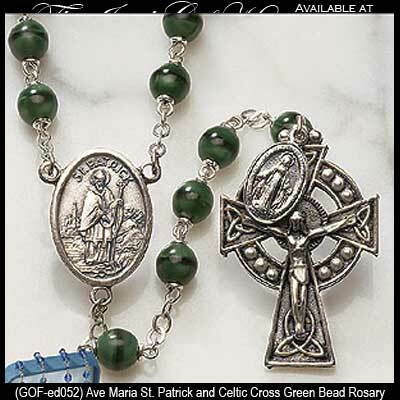 This Irish rosary features a silver plated Celtic cross along with green beads.